Other than the time that you will spend eating in restaurants and checking out tourist attractions, you will likely want to spend most of your time abroad outdoors, where you can take in the views and really embrace all that is around you. Biking around Tel Aviv allows you to tour where you want, when you want, and at your own pace. It’s a fun and inexpensive way to take advantage of the beautiful views. Of course, it’s also a great workout. There’s about a month or so when the temperature is still in the 60s in Tel Aviv. These few weeks are a prime time to take advantage of exploring the city. 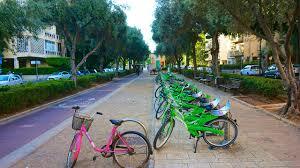 All throughout Tel Aviv there are green bikes for rent. These are called Tel-O-Fun and similar to the CitiBikes you see all over New York. The bikes cost 6 Shekels an hour, which equates to $1.50 USD. A good starting point to rent the bikes is close to the Tel Aviv Port by the “Bridge of Love” lock bridge, and from there you can start riding along the beach for miles. There is a boardwalk on the port where you can ride by restaurants and stores, as well as a bike lane that runs parallel to the beach. The views are amazing and biking is a great way to learn your way around the city and take in a lot at once. If you’re feeling adventurous, ride all the way to Jaffa, an especially fun place to go on Saturdays, as most restaurants there don’t close for Shabbat. There are be plenty of things to see all along the ride including some very entertaining street performers, cool buildings and street art. You can return the bikes at whichever checkpoint is most convenient to you.